1. Incheon International Airport (ICN): most international flights. 2. Gimpo International Airport (GMP): some regional flights from Japan, China, and Taiwan. Note: Exchange Rate US$1 = 1,150 Korean Won (KRW). "KAL Limousine" or "Airport Limousine"
The best method is to use "KAL Limousine" or "Airport Limousine" from outside the terminal building (usually 6AM - 11PM) to your hotel. 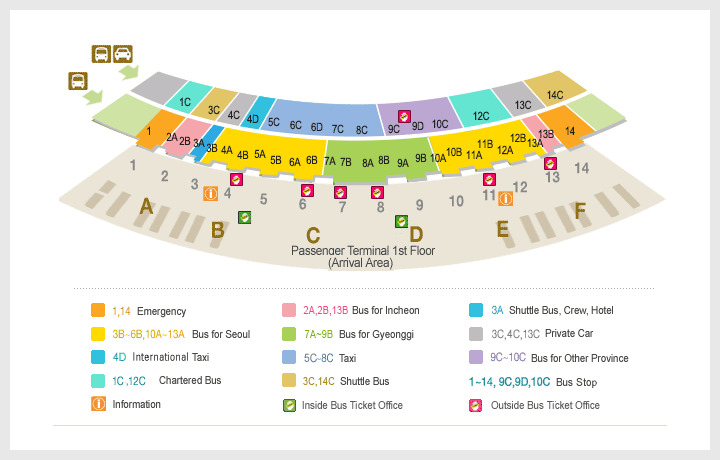 Map for Incheon Airport Bus Stops. This is the best (fastest and reliable) way to get to downtown. Departs from Airport Bus Stop 4B or 11A (right outside the passenger terminal). Runs between downtown and ICN every 20 minutes. (15,000 KRW[$13], cash on the bus or credit card at the booth). Stops at major hotels in downtown such as Lotte (President), Plaza, Westin Chosun, Koreana. Departs form Airport Bus Stop 5B or 12A. Every 30 minutes. Stops at IBIS Myoung Dong, Sejong Hotel, Royal Hotel. Departs from the Airport Bus Stops 5B or 12A. Every 25 minutes. Stops at hotels such as IBIS IBIS Myoung Dong, Sejong Hotel, Royal Hotel. "Airport Express Train (to Myeong Dong or Shinchon) "
Runs between ICN airport (via Kimpo airport) and Seoul Station. For the Shinchon area or Yonsei University, get off at Hongik Univ. of the Express train and take Subway Line #2 to Shinchon (one stop away) or a taxi. From Seoul Station to Myeong Dong, you can take either a taxi (5 minutes) or Subway Line #4 (two stops away). DO NOT follow drivers who approach you at the airport. Please use taxis at the official taxi stand. From ICN to downtown, taxi fares are about 60,000 KRW (Regular, [$52]) and 100,000 KRW (Deluxe, [$87]) including toll fee. From GMP to downtown, taxi fares are 20,000 - 30,000 KRW[$17~$26] for regular taxis. There are two types of taxi in Seoul: Regular (silver or orange) and the more expensive Deluxe (black).